For UK Convenience store, see List of Convenience stores of the United Kingdom. For UK discount stores, see List of discount stores in the United Kingdom. For UK Clothing & Footwear Retailers, see List of current and defunct clothing & footwear stores in the United Kingdom. Tesco is the largest supermarket chain in the United Kingdom. This is a list of supermarket chains in the United Kingdom. Grocery sales in the UK are dominated by Tesco, Asda, Sainsbury's and Morrisons. These, dubbed the 'big four', had a combined market share of 73.2 percent of the UK grocery market in the 12 weeks ending 4 January 2015, a decline from 74.1 percent in 2007. Discounters Aldi and Lidl have seen a combined rise in market share from 4.8 percent to 8.3 percent over that time, while upscale grocer Waitrose's share rose from 3.9 to 5.1 percent. Premier Supermarkets, a subsidiary of Express Dairies, opened the UK's first supermarket in Streatham, south London in 1951, though The Co-operative Food opened Britain's first fully self-service store in March 1948 in Albert Road, Southsea. Booths 1847 Booth Family and staff - - - 28 Found in Lancashire, Cumbria, Yorkshire, and Cheshire. Cooltrader 2001 Heron Foods 54 Opened in Wrexham, the business was founded by Iceland founder Malcolm Walker after his sacking by the Big Food Group. Cooltrader became part of Iceland after Malcolm Walker's takeover of the business, but it was sold after a review in 2012 to Heron Foods. These supermarkets are either no longer trading, have been renamed, or have been taken over and rebranded. APT Stores Chain of small supermarkets with the catchphrase The Store with More. Big W 1998 Discontinued, rebranded as Woolworths. 2004 21 store chain of megastores styled after Walmart in America; 7 of the stores were sold to Asda and Tesco (the stores that had permission to stock groceries) and the remaining 14 stores were rebranded and downsized under the regular Woolworths banner. Brian Ford's Discount Store 1975 Bought by Tesco in 2004 2010 Opened by Brian Ford after the sale of the family Ford & Lock business to Gateway in 1974. 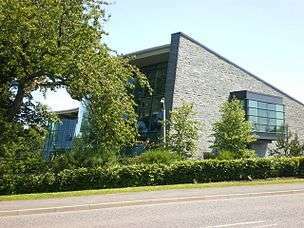 The business opened in the former Deveres Kensington engineering building in Barnstaple, Devon expanding with an extension in 1981. The business was based on the 'cash & carry' principle. 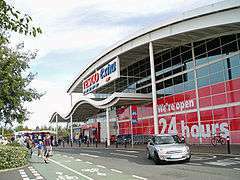 The business was purchased by Tesco in 2004 but continued to be run as Brian Fords until permission was gained to build a Tesco Extra. Cater Brothers 1958 Became part of Prestos 1979 Cater Brothers were a South East-based chain. In 1972 they were bought out by Debenhams after the death of the chairman Leslie Cater in the same plane crash that killed F J Wallis. 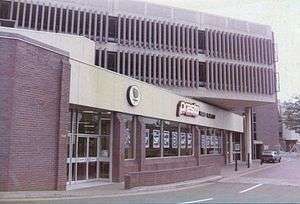 In 1979 Debenhams sold the chain to Allied Suppliers who re-branded the stores under their Presto brand. Challenge Supermarket Became part of Frank Dee Supermarket based in Yorkshire that was purchased by Frank Dee in the 1980s and incorporated into the chain. Hanburys 1889 Bought by Co-Op 1997 Started in 1889 when Jeremiah Hanbury opened a small store in Market Street, Farnworth, selling butter and bacon. In 1929, the business was bought by Bolton wholesale grocers E.H. Steele Ltd. 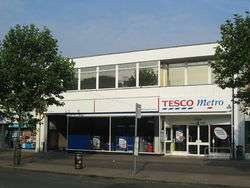 In 1997 the 31 Hanburys stores, which cover the north-west, including 8 in Bolton, were acquired by United Norwest Co-op and subsequently re-branded. Jacksons Bought by J Sainsbury 2008 See also Grandways, above, which was originally part of the same group. Stores originally traded under the Jacksons name, and were slowly converted to the Grandways brand. After the sale to Sainsbury, the Jackson name was revived for a chain of smaller stores in the Wm Jackson until they were sold and were re-branded Sainsbury Local. Key Markets Bought by Dee Corporation Created by food giant Fitch Lovell. Re-branded as Gateway. Kibby's Supermarkets Chain of supermarkets bought by Unigate. Stores were sold off to various companies including WM Low and International Stores. Kwik Save 1959 Brand now owned by Costcutter Company purchased by Somerfield in 1998. Name and 177 stores sold by Somerfield in 2006 but went into administration in 2007. Lennons Supermarkets 1958 Bought by Dee Corporation Chain of Supermarkets based in North East. 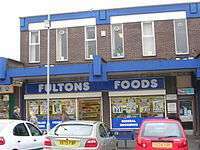 Started as small chain of grocers but opened first supermarket in 1956 in Widnes. Bought by the Dee Corporation before being re-branded as Gateway. Moore Stores Bought by Cavenham and added to Allied Suppliers group 1976 Chain of small supermarkets based in the North East of England which had a turnover of £53m in 1969/70 Rebranded either Liptons or Presto. Netto 1990 Bought by Asda in 2010 for £778M from Dansk Supermarked Group. 147 stores were rebranded in 2011 as Asda local stores. The remaining 47 stores have been sold off to other companies such as Morrisons and new convenience store UGO and other retailers due to competition laws. Netto then returned to UK, with a parnership with Sainsbury's and is initially opening 15 stores in the north of England. In July 2016, Sainsbury's ended the joint venture, scrapping the Netto name in the UK once again. 2011 Was a no frills supermarket. 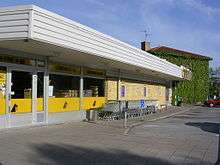 On 30 September 2011, Netto UK ceased trading. In 2014, the supermarket announced they would be returning to the UK with 15 stores. Queens Supermarkets 1958 Merged with Associated Dairies and GEN to form ASDA 1965 Small chain of supermarkets started by Asquith family in Pontefract. In 1965 merged with Associated Dairies and purchased the GEN brand, relaunching as ASDA Queens, before becoming ASDA. ASDA is an abbreviation of ASquith and DAiries. Safeway 1962 Bought by Morrisons 2005 Safeway Compact stores sold to Somerfield. Was still trading under Safeway in Channel Islands until becoming Waitrose in 2010. Sainsbury's Savacentre 1977 Discontinued, Rebranded Sainsbury's 2005 Savacentre was a joint project started by Sainsburys and BHS to compete in Hypermarket scene. Sainsburys added when BHS pulled out of the company. Saverite 1968 Bought by West Midlands Co-operative Society which later became Mid-counties Co-operative after a merger with Oxford, Swindon and Gloucester Co-operative 2000 Shropshire based grocery business started in 1869. Renamed Saverite in 1968 (from Morris & Co) and expanded into supermarkets. 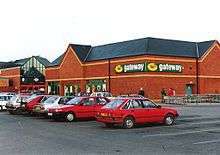 Sold to Mid-Counties Co-operative in 2000. Schofield & Martin Rebranded Waitrose c.1965 Small chain of grocers based in South Essex purchased by Waitrose in 1944. Had the first self-service supermarket store within the Waitrose group in 1951. Shoppers Paradise Taken over by Gateway Discount food store chain created by Associated British Food from un-profitable Fine Fare stores. Became part of Gateway as part of Fine Fare purchase. Wallis 1955 Bought by Somerfield 2003 Founded by Francis J Wallis of Rainham Essex in 1955. 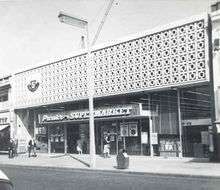 By 1968 there were 38 stores. In 1977 the chain's 100 stores were sold to British American Tobacco and merged with their already owned chain International Stores. The stores were re-branded International. The company officially still existed and was wound up by Somerfield, who had purchased International Stores in 2003. Williamson & Treadgold Bournemouth based grocers that opened a supermarket at The Hampshire Centre. The store was eventually purchased by Sainsburys. Proximity to a supermarket has been widely reported to be an amenity that can have a significant effect on residential property prices in Britain. Beginning under Andy Hulme and continuing under Mike Songer, the home mortgage unit of Lloyds Bank has published pricing research that examines the premiums commanded by homes in a given neighbourhood against comparables in the same post-code and correlates the difference in price with convenience of access to the various supermarkets. The following table averages information from neighbourhoods across England and Wales, compiled by Lloyds Bank for their 2016 report using supermarket location information from CACI Datalab and house price information from the UK Land Registry. For supermarkets worldwide, see List of supermarkets. ↑ "Asda overtaken by Sainsbury's as UK's second largest supermarket but big four continue to slide". CityAM. 13 January 2015. Retrieved 31 January 2015. 1 2 "UK: Discounters Benefit From Downturn". KamCity. Retrieved 28 September 2014. 1 2 Helen Gregory (2001-11-03). "It's a super anniversary: it's 50 years since the first full size self-service supermarket was unveiled in the UK". The Grocer. Retrieved 2010-06-30. ↑ "Aldi overtakes Waitrose to become UK's sixth-biggest supermarket". Retrieved 19 June 2016. ↑ "Supermarket market share (UK)". Retrieved 19 June 2016. ↑ "Malcolm Walker's biography - Iceland.co.uk". Retrieved 31 March 2016. ↑ "Iceland agrees Cooltrader sale to Heron Foods". Retrieved 31 March 2016. ↑ "Annual Report 2013: Performance against our plan". Marks & Spencer. 2013. Retrieved 27 July 2013. ↑ "Vintage shoppoing bags - Little Red Dog". Retrieved 11 May 2015. ↑ "End of an era as Brian Fords closes - North Devon Gazette p.25 Jun 2010". Retrieved 23 June 2016. ↑ "Biscuits again drawing support - The Glasgow Herald p.16 Jan 1984". Retrieved 11 May 2015. 1 2 3 "Capital assets - The Herald p. 23 December 1989". Retrieved 11 May 2015. ↑ "u09456 - Picture Sheffield". Retrieved 21 December 2015. ↑ "Company Check". Retrieved 11 May 2015. ↑ "Supermarket opened at Denaby - South Yorkshire Times April 10, 1965". Retrieved 21 December 2015. ↑ "End of an era as Brian Fords closes - North Devon Gazette p.25 June 2010". Retrieved 23 June 2016. ↑ "Die Nahrungsmitteldistribution in Westeuropa. 2. Dänemark, Grossbritannien By Erich Batzer, Erich Greipl, Richard Geml, Helmut Laumer, Erich Greipl". Retrieved 17 April 2015. 1 2 "Sainsbury's & Netto stores to help create 300-plus jobs in Scunthorpe". 24 July 2014. Retrieved 19 June 2016. ↑ "Morris & Co - Heritage". Retrieved 11 May 2015. 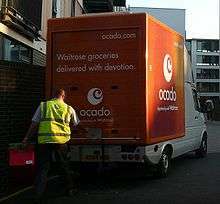 ↑ "Co-op buys rival supermarket Somerfield". AFP via Google News. 2008-07-16. Retrieved 2008-07-16. ↑ "FA Cup final: Wigan's Whelan makes poignant Wembley return - BBC Sports Website p.9 May 2015". Retrieved 30 April 2015. ↑ "Castlepoint before it was Castlepoint - Bournemouth Echo p.18 March 2015". Retrieved 19 February 2016. ↑ "Living near Waitrose boosts your house value, claims research". BBC. 3 April 2015. Retrieved 19 October 2016. ↑ "Waitrose's latest offer: £40,000 added to your house price". The Guardian. 25 July 2016. Retrieved 19 October 2016. ↑ Furness, Hannah (25 July 2016). "Living near Waitrose could add £38,666 to your house price, survey says". Daily Telegraph. Retrieved 19 October 2016. ↑ Butterworth, Myra (24 July 2016). "The Waitrose effect adds £40,000 to homes but Aldi gives just £1,300: How a supermarket nearby can boost value". Daily Mail. Retrieved 19 October 2016. ↑ "Supermarkets: top of the homebuyer shopping list?". Lloyds Bank. 3 April 2015. Retrieved 19 October 2016. It's easy to assume the effect of different factors on the value of a property but this research enables us to clearly see that there is a significant association between the convenience of a local supermarket and house prices. ↑ "Living near a supermarket can bag you a £22,000 bonus on your home" (PDF). Lloyds Banking Group. Retrieved 19 October 2016.